“Chuck” called the cable television company – let’s call them Looney Tunes – to have them remove their cable off the house so we can do the siding. It was a never-ending story. So the local office has contracted a 3rd party person to take care of it sometime within the next 2 weeks. And it is their cable and their responsibility. And that’s why we’re not Looney Tunes customers. I’ve shared this with my coworkers by email, with most of my social networks, and with friends and family. Just in case I missed anyone who works with children or just wants to know more about teaching read, here’s the latest. It’s synthesis. It’s all about putting thoughts together. Check it out. Call the little girl with pigtails. I am a geek-type person. I work in a geek-type office full of people just like me. We’re not all alike, though, and sometimes there is a lack of understanding or odd communication. Take our phones – please. 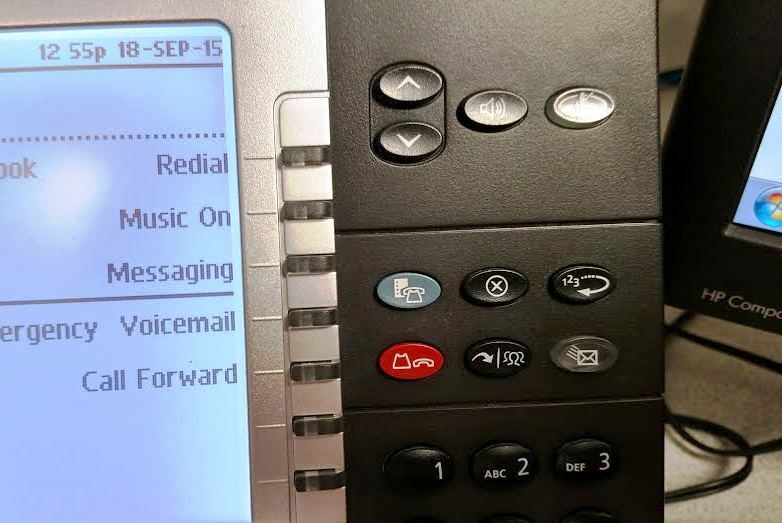 The phones switched to a new provider with new highly-visual dial-pads. (That is a word. Dial-pads is a word. Hyphenated, even.) Here’s what it looks like. I am a verbal-linguistic type. I would rather see an abbreviation on the phone or even a passcode to use the many features. As an example, it took me over a year to figure out how to transfer a call. On the old phones, I would put the caller on hold, dial the extension of the next person, and when that person answered, release the hold and let the two of them talk while I hung up and got back to work. Push the button with the little girl with pigtails on it. Then push the button on the screen for the teacher you want. Then push the little girl with pigtails again. Got it! I responded. I had been messing up the process by using the hold button, the way we used to do it. Ahem. I can do this. Which icon? Can you see the little girl? And then my verbal-linguistic friend and I found out we were interpreting the graphic all wrong. It’s actually three people. One person in front, with the outlines of two others behind him or her. Or it. Readers, your opinions? What do you see — a group of people or a little girl with pigtails? I’m sure there’s deep meaning here. Let’s have an analysis party in the comments. Meanwhile, I’ll get back to work. Complicated – that’s how I feel about Hillary Clinton running for president. I’ve admired Hillary since she spoke up on 60 Minutes and refused to stay home, bake cookies, host teas, and be the little woman standing by her man. I read her first memoir – I didn’t bother to read Bill’s. I mourned her loss in the primaries of 2008. I had to grieve the fact that her party was over before I could support Barack Obama. And support him I did, with my vote and my blog and my volunteer time. Now I’m feeling very conflicted. Hillary has all the traits I value in a leader. She’s intelligent, strong, experienced, knowledgeable, and the list could go on and on. Hillary Clinton would be an excellent president of the United States. The trouble is this: Hillary may not be the best candidate. She has baggage. Lots of baggage. Benghazi. Email-gate. Her age and gender (damn, I wish those didn’t matter). Her outspokenness. To leave Hillary’s side after following her through thick and thin and Monica Lewinsky feels disloyal. I feel like leaving her now is like kicking her when she’s down – at least when her polls are down. It’s a paradox, that’s what it is. I didn’t aim to write a review for Joanne Cronrath Bamberger’s book Love Her, Lover Her Not: The Hillary Paradox. Indeed, I haven’t ordered my copy – yet. But I am definitely feeling that paradox. I admire Hillary Clinton to the moon and back, but I can’t quite put my vote in her corner – yet. She would be a great president. I have no doubt of that. But first, she has to be electable. And no matter how high her pedestal in my opinion, I’m not sure she can will the general election. And that, my friends, is my dilemma. It started with a rummage sale or two. I hit the jackpot in a sale around the corner from my own house. 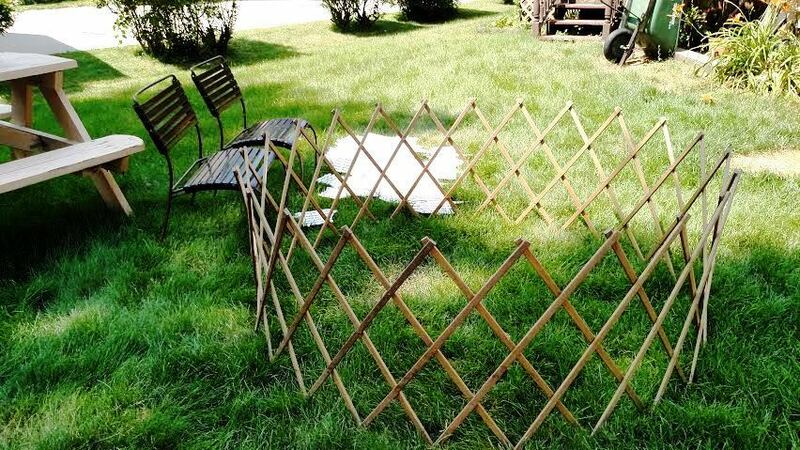 I bargained with the sellers, and they offered to include all the white fence pieces if I bought the chairs and the big circular collapsible “baby” gate. The gate is all one piece: there is no end to it. It collapses nicely, though, into very little space. I have it stored like that right now in the New Garage. I’d turned up my nose a little when Chuck found a stack of this white plastic stuff at another sale. “It’s plastic! Ew!” I had to take back my words after buying a whole pile of the same junky plastic. From a distance, it doesn’t look that bad. You can admire the garage and its People Door (simple pleasures) or the rain barrels set up behind it. Up close, it’s not so cute. However, If this white plastic discourages the wild furry ones from entering my green space, I’ll be happy. 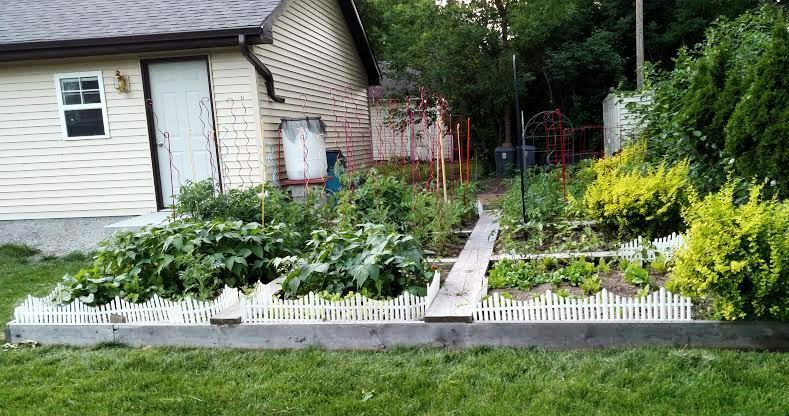 Container Gardening – a Pricey Trend? We were picking up blueberry and raspberry canes to supplement what we’ve already planted. In the process, we saw some – oh how shall I say it? 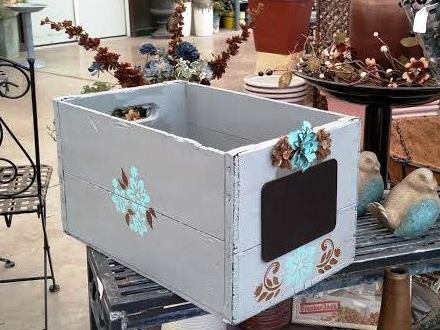 – creative mark-ups on planters and containers. Pretty, right? And rather simple. 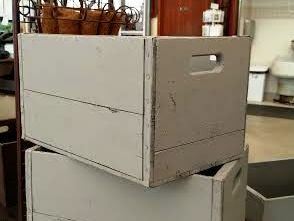 Someone took the time to paint the boxes a nice neutral gray, and then they added a few decorative details to one box. Are you ready for the reveal? The price tag? Are you sitting down? You read that right, people. $50 for the painted box. $250? 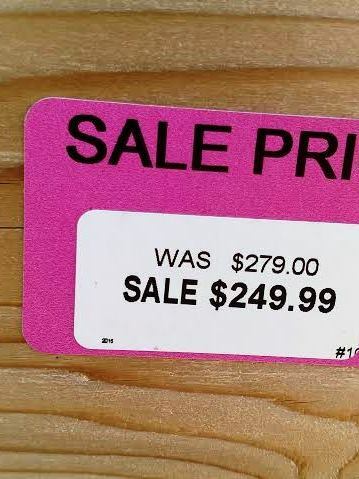 Sale price?!? Give me a break, folks. 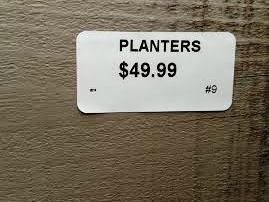 This must be the new and trendy Container Gardening for Rich People. 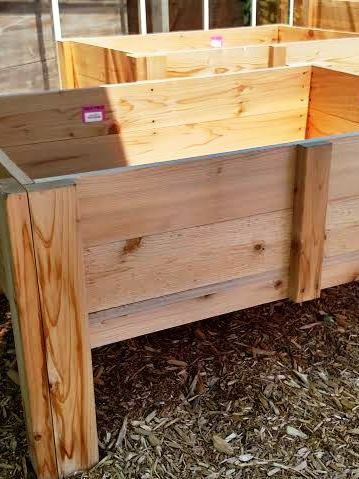 No one in my social circles would spend $50 on a wood box, much less $250 on a small wooden raised bed. Maybe I’m in the wrong field; I should be painting and repurposing my garage sale finds instead of planting in them. The profit margin would be amazing. Oh, Lego. This would be awesome. I’d buy a set to sit on my desk at school. After all, it’s art and it’s history, both of which are on my course load. Unfortunately, this set of fancy Lego sculptures can’t be purchased anywhere yet. 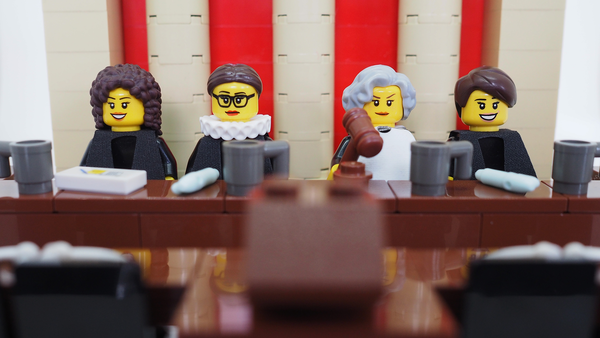 The Lego design team refuses to manufacture the female Supreme Court justices, claiming the set would be too political. I guess I’ll have to settle for the Lego White House model. If you’d like to sign a petition to pressure Lego into making this awesome historical piece, look no further than here. Barbie Goes to University – or does she? She turned up on Facebook. Where else would a Barbie bounce into view? And bounce she did, because “University Barbie” isn’t a studious type. Here she is. I admit it; sports and cheerleaders are an important part of many universities. This Barbie wears the colors and shakes the pom pons and even wears cheerleader shoes instead of heels. Nope, it’s not all bad. But why, I ask, why? 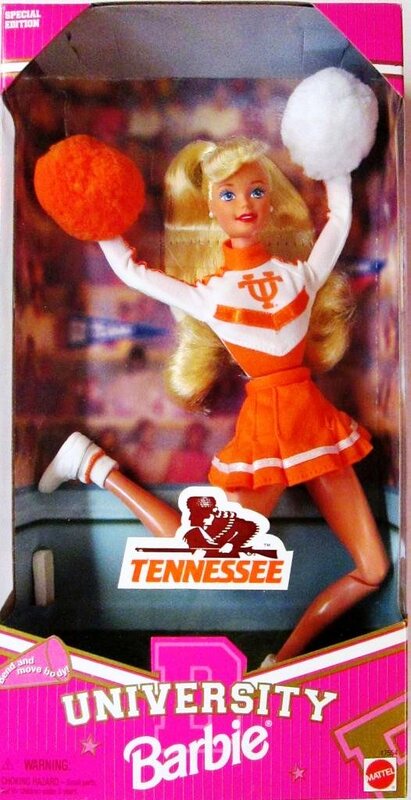 Couldn’t Mattel call her what she is: Cheerleader Barbie? She could be one in a set of Universities Barbs. There could be sorority Barbie: Greek letters on her sweater, a pledge pin on her, er, chest. Senior Barbie could wear a cap and gown and have as a prop a diploma = and student loan papers. But maybe that’s a different Barbie: Long Term Debt Barbie. She could wear…well, let’s not go that route. Yet. Science Major Barbie could wear glasses and have pale skin from too much time spent indoors between studying in the library and hovering over microscopes in lengthy lab sessions. English Major would have an old fashioned notebook around all the time in case she gets inspired with ideas for her Great American Novel. Conservatory of Music Barbie would have several changes of clothing, all of it in concert black, of course. How about Class President Barbie? She could wear classy clothing, all suitable for making speeches and doing interviews on the campus television station. She might compete with Debate Barbie, a pre-law major who is always itching for a cause she can argue. Drama Barbie’s wardrobe would include almost anything, since she’s always playing a role. Artist Barbie could sport paintbrushes sticking out of her back pocket and paint smudges on her clothes, with her big hair pulled back in a scarf or bandanna. And then there’s…never mind. I could go on and on, but my point is this: Call a spade a spade. Call Cheerleader Barbie by her true specialty. Make sure she doesn’t say, “Math class is hard.” Then make a University Barbie that looks like a student. Wait…maybe a professor? Yes, Prof Barbara (no “ie” for this one) it is! I’ll start working on the design right away. In the meantime, jump around with Barbie Badger..
My educator friends – do any of you use Teachers Pay Teachers to buy and to sell material? I’m a relative newcomer to this corner of the Internet where teachers can post lesson plans and more in the hopes that someone will pay a few bucks for the privilege of using those materials themselves. I’ve posted a few things. I’ve only sold a couple, so the money thus far is just a drop in the bucket. If I’m optimistic (and I try to be optimistic), I might remind myself that if there are enough drops, the bucket might fill. My “store” name is Ideas from the OK Chorale. If you’re an elementary teacher and you’re looking for a few good plans, please take a look! Meanwhile, I’ll push myself to post a few more goodies to appeal to other creative teachers who might benefit from my experience and ideas. In my spare time, that is. Yea, yea, I hear you snickering at your monitor. So, readers, what are your experiences with online buying or selling? Etsy? Teachers Pay Teachers? EBay? Leave a comment and let me know.